I'm sorry that I keep calling it a powder room, I really am. That sounds really fussy and pretentious compared to what it will be, but that's what the plumber (aka my father-in-law) has called it from the very beginning and I just can't retrain myself to call it anything else. Especially today, because I was in Boston for work the past four days and my brain is mush -- partly because I finished Heart of Darkness (!!!!!) while I was there. So for consistency's sake, we're stuck with this sub-par terminology. At any rate, we bought the "powder room" sink earlier this month, a purchase I've been excited to make literally since my first visit to Second Chance about three years ago. I guess it's hard to tell the scale in this photo, but this is not a very big sink. It's one of the smallest and most adorable ones they had, in fact. It's also one of the heaviest. Ez carried it an entire city block through the Second Chance warehouse without breaking a sweat because he's actually the Incredible Hulk (seriously, he made a fist the other day and tore the forearm out of his favorite dress shirt.) They even gave us 10% off for his heavy lifting efforts. I, however, cannot lift it off that windowsill, which is why this photo was taken in such an awkward location. Speaking of, I kind of want to buy this banner to hang over the toilet. 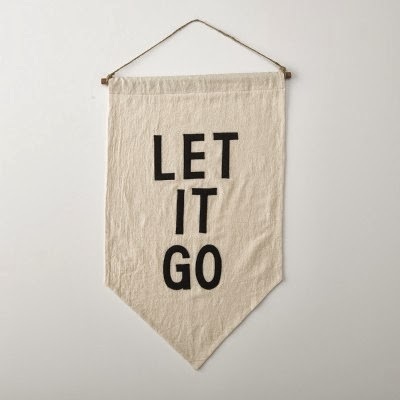 Ha, "Let it go" ............. funny. Your sink is still shiny on the bottom of the bowl. That's a plus. have a casting date underneath. (1927) Did you look there? I haven't been able to get a very good view of the bottom yet, but I'm definitely going to check! Also, it hasn't even been scrubbed yet... so it should positively gleam once it's all shined up! A subtle bit of bathroom humor..........yes, you should. Ours is on the 1st floor so we call it the guest bath.